This book is a fundamental guide to develop the skills necessary to write powerful VHDL code. 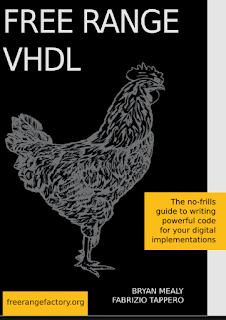 The approach taken by this book is to provide only what you need to know to get up and running quickly in VHDL. As with all learning, once you have obtained and applied some useful information, it is much easier to build on what you know as opposed to continually adding information that is not directly applicable to the subjects at hand. This book was written with the intention of being freely available to everybody. To support our work, a paperback version can be purchased from our on-line store. Alternatively, please consider a donation.